Let us show you the ropes of innovative, adaptable lighting. We are always focused on providing our customers with the highest quality products available on the LED lighting market, and LED rope lights have solidified themselves as an adaptable, functional, indoor and outdoor lighting option. We have taken this simple yet flexible light and upgraded it to reflect our values of quality, innovation, and dependability. 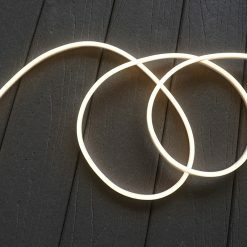 All DEKOR® products are made to stand the test of time, and our LED rope light is no different. The Flex Deck LED Rope light comes with DEKOR®’s standard 10 year warranty, proving that we stand behind our commitment to create lighting for life. 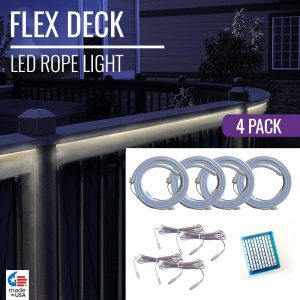 In stark contrast to our competitors, we designed an LED rope light that emits a completely hot-spot free shine from all angles so that no matter how you use it, you are getting a seamless, vivid glow from your Flex Deck. 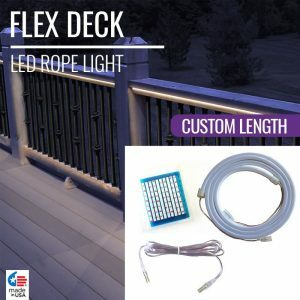 Though your average LED rope light is not a revolutionary product, the DEKOR® Flex Deck LED Rope Light shines brightly among the other spotty, dim rope lights with its continuous shine, durability, and functionality. 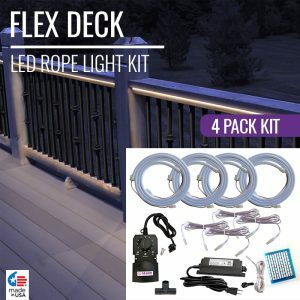 From task lighting to event lighting, available in custom lengths and rope light kits, we have a Flex Deck lighting solution that will solve even your most complicated lighting problems. 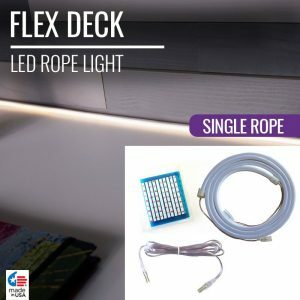 The Flex Deck LED Rope Light is perfect for lighting under cabinets, deck railings, and shelves, but the possibilities are endless. Use it to frame the inside of a dark closet door or to outline a lackluster flower bed - either way you’re guaranteed to love the way this seamless shine bends and curves to give even the trickiest spots a little luminosity. Installing a light has never been this quick or easy. With the simple combination of our patented Plug-N-Play™ technology and extra-strength 3M PSA Adhesive, the Flex Deck setup is as simple as peel, stick, and plug in. No tools or lighting expertise required. Make light work of brightening up your indoor and outdoor spaces with our Flex Deck LED Rope Light. Though we envisioned this light under deck railings and cabinets, the possibilities are endless, and we can’t say that enough. 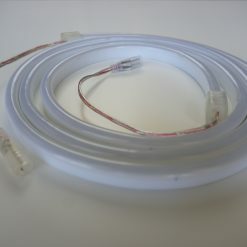 The Flex Deck LED Rope light is available in custom lengths, rope light kits, and single pre-cut five foot lengths. 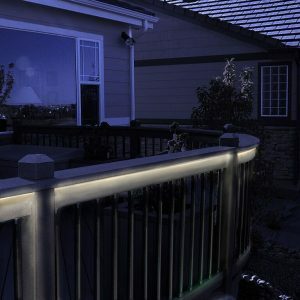 Searching for an easy-to-install light under your deck railing, or something flexible to spell out a luminous word for wall decor, or even something to highlight a long pathway? You’ve found it. Use our custom cut Flex Deck Rope Light to get the exact length you need to the inch for your most ambitious lighting projects.